I noted previously that my Against Intellectual Property and Boldrin & Levine's Against Intellectual Monopoly are both selling just fine, even though both books are available for free online. Now it's no surprise the Mises Institute publishes works in free, online versions whenever possible; it doesn't hurt sales and anyway, their mission is to spread the freedom philosophy and sound economics. But I was a bit surprised that Boldrin & Levine's publisher, Cambridge University Press, would allow them to put a free version of the book online; my experience with Oxford University Press (1, 2, 3, 4) would have led me to suspect publishers would be reluctant to permit this. When I inquired of Levine how they were able to manage this feat, he told me they simply bargained for it. The clause they got is as follows: Clause 3(a) grants to Cambridge "sole and exclusive right and license to produce and publish and itself further to license..." with some exceptions. Clause 3(b) reads: "(b) Notwithstanding clause 3(a) above, on first publication of the Work, the Author shall have the non-exclusive right to post the files of the published Work on his/her own and/or his/her institutional website subject to the inclusion of the copyright notice, full acknowledgement to Cambridge University Press and an appropriate hyperlink to the Cambridge catalogue." In response to my surprise they were able to negotiate this, Levine told me that "academic journals give that as a matter of course - maybe for an academic publisher it isn't such a big deal? They didn't fuss about it, and it didn't sound like it was the first time they did it." Could it be that some publishers are starting to get it? Hypocrisy (or the state of being a hypocrite) is the act of preaching a certain belief or way of life, but not, in fact, holding these same virtues oneself. For example, an adult telling children not to smoke cigarettes, even though the adult smokes. Copyrighting a text that argues against copyright, that looks like hypocrisy to me. One might argue about mitigating factors, but calling a very reasonable criticism ridiculous isn't much of an argument. "Kid," you wrote, "Copyrighting a text that argues against copyright, that looks like hypocrisy to me." You are using copyright as a verb, as if Boldrin and Levine took some action to "copyright" their writing. They didn't. It's federal law that automatically gives authors a copyright in their works. Might as well blame them for having a right to sue for discrimination or claim social security benefits. Why people who are clueless about the actual nature of the IP law they defend insist on piping up about it is a mystery. Perhaps, Stephan, by 'Copyrighting' Kid meant 'Not providing a copyright neutralising license for'? Incidentally, I didn't suggest that the authors were being hypocritical, but that it was hypocritical for the book to be subject to monopoly (without neutralising license). As to any culpability of the authors I merely raised the question as to whether they could be indicted for their selection of publisher. The fact that copyright is automatic by default is something that authors cannot be blamed for. However, automatic or not, copyright can be neutralised. The publishers of "Bound by Law" did it very nicely. If you are unfamiliar with this book, you may find it here (for free, I might add). It can't be hypocritical for a book to be "subject to" monopoly "without neutralizing license," without someone being a hypocrite. That can only be the publisher, or the authors. The authors are not hypocritical, since they didn't cause the work to be "subject to copyright"--that's done by federal law. The publisher is not hypocritical, since the publisher is not opposed to copyright law. As for selection of publisher, I am surprised they found a mainstream one that would allow a free online version, and fought for it. I suppose they could have self-published, or just not published it at all, but there is no reason to suggest they have an obligation to scuttle their own work. Their creed is not martyrdom. 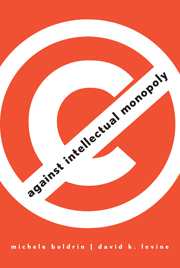 Stephan, we have a book 'Against Monopoly' being subject to monopoly despite it being notionally within the authors' power for the book to not be subject to monopoly (via a neutralising license). After all, unless the book was a work for hire, the authors were the initial possessors of the book's copyright. Perhaps the authors had a good faith belief that the copyright could be neutralised to their work, but for some reason this could not be achieved? Perhaps the authors made an unfortunate selection of publisher who whilst initially receptive to the authors' wishes to neutralise the monopoly over their work, may have later changed their mind? On the other hand perhaps the authors felt that transferring the copyright absolved them, and transferred all responsibility for (exercising or neutralising) monopolistic privileges entirely to the publisher? It remains possible for a book to be hypocritical in the adjectival sense 'behaving contrary to thesis' without the authors being hypocrites. Whilst I'm happy to argue that the book is hypocritically subject to copyright, I am in no position to judge whether the authors are hypocrites, and have at most only queried their selection of publisher.